VOL. I NO. 52 REG. NO. L5015 DELHI, THURSDAY SEPTEMBER 9, 1943. HAYNES TO LEAVE THEATER FOR U.S.
GLAMAZON "Glamazon" is a new word some smarty coined to describe six foot, two and one half inch Dorothy Ford. Combination of "Glamour" and "Amazon" - get it? Dorothy is pointing to a V-design of war stamps on her shapely gam, it that means anything to you. Announcements of new shifts in the 10th Air Force made necessary by the recall of Brig. Gen. Caleb V. Haynes to Washington, was made at Rear Echelon Headquarters this week by Brig. Gen. Howard C. Davidson, 10th Air Force commander. Haynes, who has been Chief of the American Air Command No. 1, will be replaced by Brig. Gen. Donald Old, until now Davidson's Chief of Staff. Old, in turn, will be replaced by Col. John Sutherland. "Washington asked us if we could spare Haynes," Davidson said in announcing the shift, "and when Washington asks a question like that, there can only be one answer. He has been our Rock of Gibraltar and we shall miss him." Davidson was emphatic on the point that the new, unannounced assignment for which Haynes is being recalled is one of extreme importance and represents a flattering evaluation of Haynes' consistent work in this Theater. Davidson also totted up the score piled up by the 10th Air Force during the month of August, its second full month against the monsoon. Due to extremely unfavorable flying weather, the total tonnage of bombs planted on enemy installations dropped slightly in August to 691 tons as compared with July's total of 760 tons. This was in spite of the fact that the medium and heavy bombers dropped more bombs than ever before during the month, but the total was cut because fighter-bombers were unable to get up with their loads. The bombers flew 25 out of the 31 days but the fighters were able to make only 53 sorties as compared with 248 in July. Enemy opposition was not heavy in the air, the heaviest Jap interception consisting of only six Zeros, two of which were shot down without loss to the Americans. An additional Jap fighter also was shot down. During the month the Americans lost two bombers but the entire crew of one has reached safety. This was quite a week for the crews of the 10th Air Force. It can be described best by comparing it to a hell of a good football game - such as the time the Chicago Bears walloped the Washington Redskins, 73-0, in the championship game. In this case the 10th are the Bears. There were plenty of pulverizing power plays through the line, sweeps off tackle, long passes and touchdowns galore. The kicks all came from the Japs. Everybody made All-American and those of us in the grandstand had a swell time. variety was the keynote of the week. Each mission was as different as the girls at a local dance on Saturday night. There was a 2,000-mile over-the-water jaunt to Car Nicobar that got press notices all over the world. Rangoon received a call for the first time in weeks. Chauk looks like Ploesti and they are going to have to go prospecting again for the Namtu mines. The B-24's and the B-25's kicked off by slapping railway yards all over the lot on Sept. 1. The B-25's even put a new twist into these familiar tactics. They bombed a cliff above the Hsipaw railway yards and this Fancy Dan maneuver is believed to have started a landslide. The usual high scores on trackage and rolling stock were rung up there and at Ywataung. Several buildings were demolished at Monywa and a dandy fire was started at Sagaing. Smoke rose to five thousand feet. The B-24's did similar things to the Mandalay yards, starting two fires that were visible for 50 miles. The P-40's got their share of the spotlight on the same day by causing supply shortages at Taro and Lakchang Ga. At taro, three buildings were flattened by direct hits and three more went up in smoke. Other fires were started and were still going when the boys left. Five buildings were in flames at Lakchang Ga and smoke from several others indicated that the local fire department was going to be kept very busy. Pwawbwe, 95 miles south of Mandalay, received 40 tons of calling cards from B-25's and B-24's on the 2nd. Warehouses and possibly the station went on the scrap heap as well as tracks and rolling stock. Japs lucky enough to be out at the time were trying to find their belongings in the pile of old lumber that was their barracks. Fires made their search pretty futile. Just to prove that oil and gas were kept at other places besides Ploesti, the mediums and the heavies plastered Chauk on the same day. After the shooting was over, everyone within 80 miles knew exactly where Chauk was. One of the umpteen fires started was visible that far. People within 60 miles found it twice as easy, since another blaze with an 8,000-foot plume, could be seen from that distance. In addition, the tank farm, receiving tracks, filtration plant, warehouses and workshops were all ablaze. Gas rationing in Burma is going to be a tough proposition from now in. Other mediums kicked the dock around at Toungoo. The heavies made the world sit up on the 3rd. BBC in London talked about their 2,000-mile visit to Car Nicobar Island more than the invasion of Italy. Inquiries were received from the good old USA by cable for additional details. It was a sweet job of over-water navigation and the bombing was just as good. Docks and adjacent installations took several direct hits. Near hits didn't do a 100-foot barge any good either. At the same time, the P-40's strafed and set fire to a 60-foot boat in the Irrawaddy south of Myitkyina. The heavies still like to fly a long way, so on the 4th they paid a long-delayed visit to Rangoon. They gave the waterfront a good going over, but clouds got in the way of accurate observation. The Letpadan railway yards, 75 miles northwest, got beat up, but good. Thirty tons of bombs did the trick. Tracks went every which way. Three explosions following direct hits on warehouses produced four fires. Smoke rose to 3,000 feet from one of them. Mediums, in spite of the cold shoulder, couldn't stay away from Hsipaw. One warehouse and two buildings were destroyed to the tune of several fires. They left one less locomotive and two fewer engine sheds at the Namyau railway yards in central Burma. A large fire made observation easy. The B-25's delivered the haymaker of the week on the Namtu mines the next day. The diesel power plant was completely destroyed. The engine sheds are all over the landscape along with several other smaller buildings. An explosion and fires accompanied the show. The flotation and separation plant got it right on the button and are much the worse for wear. To top things off for the week, the mediums made a bonfire out of the Jap barracks at Maymyo on the 6th. It was good marksmanship with nearly all bombs on the target. The nice thing about all of these was that everyone got back in one piece. 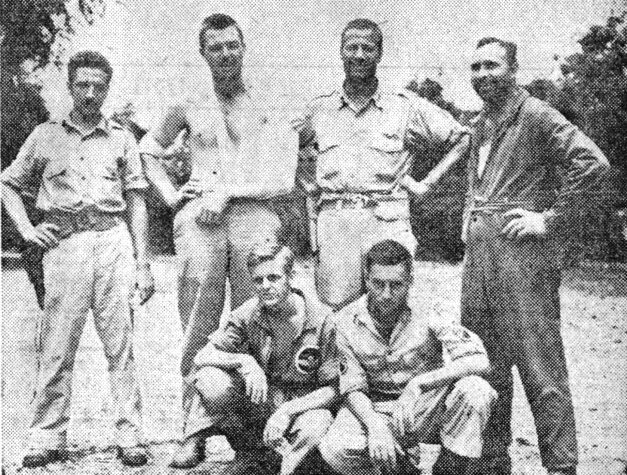 Back row, left to right: Lt. William X. Zeidler, navigator; Lt. John Perdue, Co-pilot; Maj. Robert D. McCarten, pilot and squadron commander; Capt. Oswald O. Southworth, photographer-observer. Front row: S/Sgt. Earl Tischendorf, engineer-gunner, left; S/Sgt. Albert Chibnik, radio-gunner. It is customary in the movies for the aviator-hero to come nonchalantly strolling back to the midst of his mates, after being shot down and given up for lost, but . . . it does happen in real life, too! Six members of a Skull and Wings medium bomber, four officers and two enlisted men, recently had a similar experience. Forced to bale out of their crippled ship over the wilds of an Indian jungle, the sextet reached the safety of an American base only after a perilous four-day trek, by land and water thru some of the most rugged country in this theater. When reports of their safety reached the squadron, everyone murmured a fervent little prayer of thanks, for a more popular or capable crew it would be difficult to put together. Its personnel consisted of Maj. Robert D. McCarten, squadron CO, Lt. John Perdue, his co-pilot, and Capt. Oswald Southworth, photographer-observer, all three big husky blokes, and Lt. William X. Zeidler, veteran navigator, S/Sgt. Earl Tischendorf, engineer-gunner, and S/Sgt. Albert Chitnik, radio-gunner, three little guys. All were cut and bruised aplenty and much the worse for wear, but Perdue, who suffered an arm injury in his jump, was the only real casualty. Even that could not keep that big grin off his boyish face for more than a moment. According to the six jungle-scarred travelers, the inhabitants where they landed were quite friendly (when they handed out the "baksheesh") and directed them to a nearby village where, four hours later, all six were assembled and overjoyed to discover that everyone was safe. They had no trouble obtaining the services of a couple of natives to ferry them via small sampan down a nearby stream, but admitted that after the second day it sometimes took intimidation and a little coercion to keep their gondoliers from turning around and going back. During the four days, the men subsisted mainly on rice with a little roast chicken "a la Southworth" when they could get close enough to some unsuspecting fowl. Commenting on the food situation, Perdue said, "That concoction (a la Southworth) may not have looked so hot, but brother it tasted mighty fine." Making the best of their situation, the men had time for a little fun, too, on their trip downstream. For instance, someone nick-named one of their complaining boatmen "Big Stinker" and he was "Big Stinker" from then on. He too, like the villain in the Abbott-Costello movies, seemed to like it. The last lap of the journey was made by motor launch, which was a welcome relief for the tired airmen who were impatient with the slow progress of the sampan and anxious to reach the American base so that they could send out word of their safety. LOVELY TO LOOK AT HEAVEN TO KISS Sometimes we try to be different about our cheesecake, but other times we merely fall back on the good old tried and true. 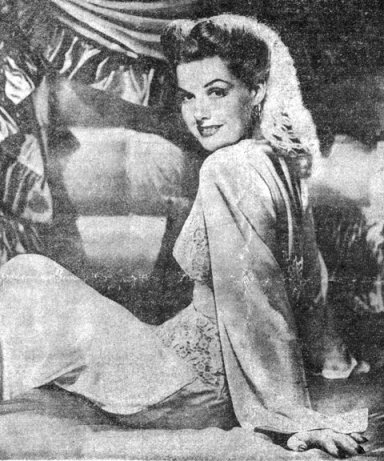 If there is a man in this Theater who doesn't like this picture of lovely Ann Sheridan, we have a gold-embossed Section VIII certificate which we shall be happy to hand him upon application. After a blitzkrieg visit of the China-Burma-India Theater in which they spoke to everyone from Pvt. Joe Doakes to Generalissimo Chiang Kai-shek, five American senators whisking through the world's warfronts have arrived by air in Australia, according to word reaching India. They spent considerable time every place they visited with the "Gee Eyes" and got an earful of inside dope which they promised would reverberate through Congress. Censorship restricted any mention in the press of their presence here until after they had safely left. I am a novice, here in India, and have seen a "Miss" this and a "Miss" that in the newspapers and periodicals back in the States. So I thought it might be appropriate to donate a "Miss C.B.I." to your noteworthy rag. I hope it meets your approval. Sorry I couldn't submit a photo, but I prefer drawing. Besides, the equipment and a model are practically impossible to get out here. Some of the G.I. 's around here and I are looking forward to seeing our brain-child in a future edition. Yours truly, (signed) Pfc. S. P. Miner. of Kentucky (D); Henry Cabot Lodge, Jr., Massachusetts (R); Ralph O. Brewster, Maine (R) and James M. Mead, of New York (D). Meeting about 500 American soldiers for two successive nights at the colorful American Red Cross "Duration Den" in New Delhi, the Senators promised, "Anything the Congress of the United States can do for you men out at this end we want to know." Their eager listeners didn't spare the whip. They told the senators to pound it into Congress that American soldiers in India wanted a lot of action in a hurry regarding such "important" questions as getting started against Japan, home leave after a long stretch overseas, more beer and cigarettes and - a division of WACs out here. Senator Russell cheered them, when he said: "We recognize that some of you men have been out in this theater 18 and more months, which is too long. Our entire committee believes there should be a definite policy of sending a man home after a specified time and is going to make a unanimous recommendation on that score." Clad in rumpled G.I. uniforms and Army sun helmets, traveling in a converted Liberator upholstered as plushly as the 20th Century Limited, the senators already had been underway five weeks when they hit India - having seen Iceland, England, North Africa, Sicily, the Middle East and Persia. "The United Press made an initial poll of senatorial opinions as soon as they landed in order to avoid giving them time to acquire any local prejudices. It revealed that the party unanimously favored: firstly, our side versus the Axis; secondly, better Army messes; thirdly, more beer for the soldiers; fourthly, all Army measures for security of the senators; fifly, a quick and safe return to the United States for everyone concerned, including themselves. "They unanimously opposed: firstly, Hitler, Mussolini and Tojo; secondly, the climate practically everywhere they had been; thirdly, embarrassing questions regarding anything but especially regarding when the war was going to begin in the CBI Theater, when we are going home and all questions relating to the postwar era. On the Democratic vs. the Republican party they were divided, three to two." The 10th Air Force rewarded 153 pilots and crew members for outstanding service and gallantry at their posts this week with the presentation of the Distinguished Flying Cross, the Silver Star, the Oak Leaf Cluster and the Air Medal. Twenty-six officers and 22 enlisted men received the Air Medal, 15 officers and 10 enlisted men Oak Leaf Clusters, 28 officers and 42 enlisted men Distinguished Flying Crosses and one man, Maj. Joseph S. Pirruccello, was awarded the Silver Star. Maj. Robert D. McCarten, Capts. Robert E. Dethlefsen, Kenneth W. Trout, Lts. James H. Collins, William T. Larkin, Teller S. Price, Austin H. Russell, Robert K. Berry, Marvin W. Fey, Chester M. Bawol, Albert J. English, Harold W. Goad, Allen Kass, Frank J. Maholhic, John E. Stephens, Harold K. Trinkle, Irving L. Kuehnast, Hugh R. Walker, Robert E. Reimann, Ray L. Ryder, Richard N. Cordell, Michael E. Donovan, James F. Duffy, Hugo R. Franz, Jr., William B. Goris, Harold V. Larkin, James R. Meyer, Claudius B. Ward, T/Sgts. William T. Hays, Delmar C. Harland, Phillip E. Patterson, William T. Anderson, Omar A. Austin, Minor F. Green, Max H. Isaacs, James Marshall, Leo E. McDaniel, Ernest M. Neil, Jerald O. Peck, Royal E. Peterson, Louis L. Russell, Roman H. Shaffer, Theodore S. Smith, Charles Steinberg, S/Sgts. Richard L. Johnson, Grant L. Butcher, Robert V. Gamble, Richard J. Lauritzen, Victor L. Miramontesi, Clarence E. Pawkett, Elliot J. Ryan, George D. Samson, Lewis Hume, Jr., Sidney S. Tronic, Melvin R. London, Vernon S. Cook, Charles E. Douglas, Thomas Pratt, Robert E. Hutton, Vernon F. Willette, Warren W. Stubbs, Robert R. Banner, William P. Burtch, Henry J. Caldwell, Richard C. Johnson, William H. Kirk, Ernest G. Schuessler, Sgts. Leonard M. Josephs, William H. Potthast, Alfred Sullender. Maj. Wesley Werner, Capt. Francis N. Thompson, Lts. Warren M. Vandebogart, Ralph M. Olson, T/Sgt. Royal E. Peterson. Lts. James R. Barton, Bill Wright, Jasper L. Godwin, Francis T. Bonsteel, Jr., Gordon E. Cleland, Joseph B. Coambs, Robert P. Currie, Walter C. Stewart, Jr., John E. Thornton, Richard L. Weis. Capts. James O. Reebuck, Don P. Webster, Elmer L. Tarbox, John A. Hass, Oswald O. Southworth, Aiden L. McMurtry, Lts. Thomas S. Ingham, Jr., William T. Larkin, Robert B. McKee, Jr., Ja,mes H. Collins, Joseph A. Lessard, Clyde E. Trussell, Jr., Paul F. Taylor, William A. Adams, Richard E. Newsby, Vern W. Keele, Homer C. Haarbauer, Harold W. Manifold, Russell L. Rauch, Joel H. Teasley, John A. Neudorfer, John A. Podawiltz, Lawrence E. Skipper, Hugh R. Walker, T/Sgts. Robert A. Mocklin, Raymond H. Nichols, Pete Hinman, Sydney A. Nunez, S/Sgts. Jerry M. Brown, Charles F. Haggerty, Robert J. Breakie, Marvin A. Buchfhrer, Joseph A. Mueller, Lester J. Raasch, Gerald M. Weber, John F. Jaeger, Robert H. Murphy, Marshall W. Rusth, Conway W. Smith, Francis J. Winderl, Joseph E. Woodburn, Sgts. Douglas M. Labat, Sam Cohen, Jack D. Leeper, Pfcs. Robert C. Mason, Bruce A. Craft. If you haven't heard from honey-bun lately, it may mean that she's met a sailor and has forgotten you, or it may not. On the other hand, if you suddenly get two exactly similar letters in her own fair hand, this doesn't necessarily prove that she's gone off her chump. What's happened is that there's been another plane accident and "a little mail," to quote the Theater Postal Officer's office, got lost. The "little mail" turns out to be 8,000 - count 'em - 8,000 letters for up-country A.P.O.'s. Which doesn't mean a thing to the modern A.P.O. As in a similar case recently, the A.P.O. station at an East Indian Port was notified, reprocessing was immediately begun and those little envelopes will be winging their way to their rightful recipients again. There may be some duplication. So, if you get two letters instead of the one you are supposed to receive, be big about it. Pass the extra copy along to a buddy. he'll appreciate it, and so, undoubtedly, will honey-bun. 14TH AIR FORCE HEADQUARTERS - Maj. Gen. Claire Chennault, who has been a ranking Jap nemesis from the days when his guiding genius helped the Flying Tigers hold the skies over Burma until his present role as Commanding General of the 14th Air Force, unleashed his flying commandos on Jap objectives again last week, continuing their performance of the week before when they sent 78 Jap Zero fighters plummeting to the earth in flames. Three days of versatile attacks, from dive-bombing missions to heavy bombardment on Jap shipping lanes and dock targets, kept the Nips harassed and completed a big month of 14th activity. The P-40-conscious Japs received a visit from two waves of the famed 14th fighter planes on August 27th, when they attacked targets in the vicinity of Yochow, the first flight sweeping the river stretches, strafing and burning river craft, while the second peeled off and headed for a motor convoy where four trucks were destroyed and 15 damaged, all loaded with Jap troops. Two steamers of 125 and 65-foot dimensions were burned, as well as one small steamer and a small gunboat, and rail installations and moving trains were raked by the bomb-toting P-40's. On the 29th and 30th P-40's accompanied by B-25's bombed advance enemy bases from occupied China to Indo-China, bombing and strafing selected and opportune targets of enemy transportation, communication, airfields and shipping facilities. The enemy air base at Kingmen was the first target, where the entire installation was blasted with hits, with plumes of flame vomiting up from runways, taxi strips, revetments and hangars. The Canton-Hankow Railway was the victim of raids on August 30th, when four locomotives and four railroad stations were blown up, skip bombing along the route took a heavy toll on moving targets and the Changanyi Railroad Station, where warehouses, a water tower and 10 railway cars were destroyed. The strategic enemy staging point at Owchikow in the Tung Ting Lake area was bombed and strafed twice, destroying fuel storage dumps, machine gun and anti-aircraft positions and other important installations. Shipping again was the target off Hong Kong when P-40's attacked two 250-ton freighters, escorted by an armed sub-chaser, badly damaging or destroying their targets, while in another attack along the Yangtze, fighters caught and thoroughly strafed two 75-foot gunboats and a large river boat, leaving all ships in a sinking condition. Completing the month's activity, on August 31st B-24's and P-40's blasted runways at the Gialam Airdrome near Hanoi, dive-bombed a 450-foot ship near Stonecutter's Island off Hong Kong, dive-bombed positions south of Hankow on the Hankow-Canton Railroad, struck at yards at Yoyang, rolling stock at Changanyi and a grain warehouse at Sinti, while B-25's attacked the new Remy Airfield at Ichang on the upper Yangtze, all with excellent results. Cost of the entire operations for the five-day period was but one plane, which was reported as missing. SO THE 10TH AIR FORCE CAN'T HIT THE MYITNGE BRIDGE, HEY? Sometimes it's almost impossible not to feel a little sorry for Mr. Moto in Burma. He works so hard and gets so little done. The above pictures tell part of the story of the fruitlessness of his efforts. On August 3, bombers of the 10th Air Force knocked out one span of the famous Myitnge Bridge, which the Japs must have to supply their troops in Burma. So Mr. Jap went industriously to work to replace it. With great effort he got pontoons under the fallen span, as the picture on the left shows, and was about to float it back into position. The hard-hearted 10th waited until the job was almost done. Then, this week, they let loose with another load, as seen in the center picture. The results? The picture, right, tells all. Now our little slant-eyed brothers have another span to worry about, but plenty. Must be discouraging. 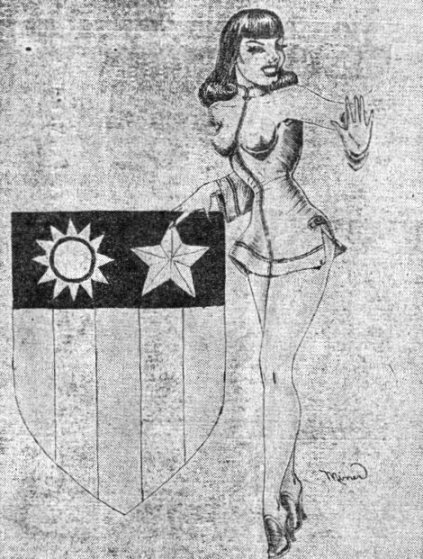 CHINA AIR BASE - The "Ding How Follies" lived up to their name. They were really "ding how," or as the Chinese, who have relinquished this phrase to their American allies would say, the show was really "okay." A capacity audience, headlined by Maj. Gen. Claire Chennault, applauded enthusiastically the first dramatic effort staged recently by the men of Col. Eugene H. Beebe's heavy bomb group. Directed by Lt. Arthur "Red" Karp and Lt. Mark M. Conn, the "follies" included a variety of acts - a strip tease by Pfc. Richard Donegan, risqu� songs by Sgt. John J. Atkoczaitis, trumpet solos by Bob Cobb, who formerly played with Al Donahue and Bob Chester's orchestra, harmonica selections by a trio composed of Lt. Vacat, S/Sgt. Russell Toutant and Cpl. Bill Ellis, accordion solos by S/Sgt. Mitchell Wojciechoski, barber shop tunes by Sgt. James R. Kline, Sgt. W. J. Walsh, Cpl. Frank Sole and T/Sgt. Al Piro, who was master of ceremonies; selections by an orchestra led by Lt. Addison bailey; skits starring Lt. Richard B. Young, Pfc. Donegan and Pvt. Ed Peters; choral numbers by a group of Chinese cadets; and a dance (?) by members of the chorus - Sgt. Bill Stewart, S/Sgt. Carl Rudin, Sgt. Mike Pollock, Pvt. Peters, S/Sgt. Toutant and Cpl. John Prewitt, all daintily attired in chiffon, crepe and other gauzy material designed to show the allure of their footballish figures. ASSAM Q.M. DEPOT - We up here are in a dilemma about EFM messages. We think it's a swell service in general, but our big beef comes when we try to use it. In short, we go nuts trying to pick out at least three of the standard texts which, when put together, won't make the folks back home start working on a padded cell to house us on our return. "Hearing your voice on the wireless gave me a wonderful thrill. Glad and proud to hear of your decoration; everybody thrilled. I wish we were together on this special occasion; all my best wishes for a speedy reunion." Whereupon, Mater starts the rumor that her dear little Elmer has been shell-shocked. "All well; children evacuated. Good show; keep it up. Hope you are improving." In reply he gets a curt little note informing him that the apple of his eye has left to get the "death do us part" vow Reno-vated. Then there is the candidate for the Brush Off Club who thinks a cablegram to his Sugar might mend the rift. He reads, rereads and reads again the almost unlimited abundance of stock phrases, but to no avail. None seem to suffice for a sugar report. In desperation he holds a one-man lottery. Into a hat he places numbered slips of paper corresponding with the numbers of the available messages and proceeds to withdraw three slips. The numbers drawn are 86, 79 and 119. His message is as follows: "Daughter born. Illness is not serious. Good luck; keep it up." Honest, guys, something oughta be done. EXPOSED No matter what he has been telling the G.I. 's of the 14th Air Force, Marion Hargrove, author of the Army best-seller "See Here, Private Hargrove," is no sergeant, only a T/4th. Read Hargrove's story for the gory details. In my first twenty-six months as a plain blunt warrior in this man's Army, I have had little or no trouble with the Army Finance Department. I have gone far out of my way to maintain friendly relations with the AFD. I might say that I have gone more than halfway in friendly overtures. On the whole, the Finance Department has been a pretty good bunch of joes. They have red-lined my name on the payroll, sometimes as often as eight times in one year, but I have never chided nor scolded them for it. I never opened my mouth when their boys over at the Office of Dependency Benefits trailed me around the world for four months with a notice that the compulsory allotment of $50 (gold) per month for my good and trusting wife, Mrs. Alison B. P. Hargrove, had been cancelled. The postcard they sent was addressed, as plain as day, to T/4 Marion Hargrove and it said that the Government was no longer contributing to the support of the aforementioned Mrs. Hargrove - because I was in an ineligible grade. The news and the postcard and the whole idea of the thing were painful and depressing. In the first place, I had been batting it about the whole 14th Air Force that I was a full-ranking sergeant and when the gang of hoodlums at the message center saw the address, the whole 14th soon knew that my three stripes were gold instead of silver, that I was just another technician posing as a non-com. To a retired non-com, this come-down is most galling. Hell, I was a full corporal once! 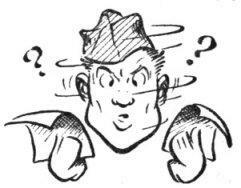 The combination of T/4 and "ineligible grade" provided gory and unnecessary material for the boisterous and unfunny cut-ups of Headquarters Squadron, an outfit of amateur comedians without one straight-man in the whole crowd. I have been subjected to every form of corn and ridicule. I have been called the Army's ranking technician-fourth; I have been referred to as the only technician-fourth to be found in the first three grades; I have answered to the designation, "technician fourth-grade first-class." My life has become a hell. Besides these awkward barbs of purest humor, I have been besieged by letters from my good and trusting wife, Mrs. Alison B. P. Hargrove, who wants to know what has happened to the monthly allowance I promised the government would send her. Since Mrs. Hargrove has a wicked left jab and a good three-inch reach on me, this is no laughing matter. In spite of all these troubles, however, I have never made one complaint or uttered one word of bitterness toward the Office of Dependency Benefits or toward my great and good friends of the Army Finance Department. Today was a different matter. Today brought the sort of news that strikes at the heart of a man and fills him with disillusionment and despair. Today the Finance Department has lost a faithful friend, namely me. According to a note which reached the squadron today, heavily burdened with a couple of dozen endorsements from Fort Bragg and 42nd Street and the Port of Embarkation which shipped me out, I owe the Army Finance Department five dollars and ten cents, which they have been trying to collect since November, 1941. This base and insulting document, which was read to me word by word by our first sergeant, says that through someone's oversight the Army started paying me thirty dollars a month in October, 1941, when I was supposed to be drawing $21 a month. Before I finished my four months as a private third-class I had collected the staggering total of $5.10 (gold). Relentless and determined, slow but sure, the Finance Department's investigators have dogged my footsteps for almost two years - and now they have me, dead to rights. We have decided, the first sergeant and I, to have the $5.10 deducted from next month's pay. It will mean that instead of fourteen dollars and some odd cents, I will be paid only nine dollars and some-odd cents, which will scarcely buy three bottles of Chinese gin. After that, I suppose, things on the surface will be calm and serene. ROUNDUP HAS VISITOR The full story of how "Anna," a 125-pound Bengal tiger cub, happened to visit the Roundup office is related below. Here Anna takes a look at a recent Roundup, held up for her by Sgt. Hattley McDowell, and if we judge her expression correctly, isn't too much impressed. "The civilian, Marion Hargrove, is herewith informed that he owes the War Department the sum of ---, representing bills for Government Issue laundry services contracted and unpaid during the month of July, 1941. Unless immediate action is taken to pay this amount . . . "
Ain't that a helluva future to look forward to? 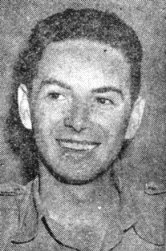 SHREVEPORT - Robert Kenneth Chennault, 18, son of Maj. Gen. Claire Chennault, Commander of the Fourteenth USAAF in China, was inducted into the Armed Forces here. Robert is the fifth of the general's sons to enter the U.S. forces. The other four sons are Lt. Col. John S., who is now in the Aleutians; Claire, who is an aviation cadet; Charles, who is an Air Force sergeant and David, who is a Navy fireman, first class. It was on Wednesday, at just the time each week when Ye Ed is in the final throes of putting the Roundup to bed and hence not fit company for man nor beast, that the bland and innocent-faced sergeant advanced with military tread to the table at which Ye Ed was fighting the last bloody battle with the make-up sheet for last week's Roundup. "Good morning, sir," the sergeant said. "I'm Sergeant Hatley McDowell." "So what?" we snarled. "So I came to ask you, sir," the sergeant replied, "what am I going to do about the tiger?" Ye Ed jumped to his feet. "Gawd, it's getting me!" he moaned. "Do you know, Sergeant, it sounded to me exactly as if you'd said 'what am I going to do about the tiger?'" "That's what I did say," the sarge stoutly maintained. "Gen. McCabe told me to ask you what to do with the tiger." And it wasn't a gag. This soldier actually had a 125-pound Bengal tiger cub chained outside, which he was now, as directed, turning over to the Roundup. The idea, he said, was that we were supposed to make it a Theater mascot, or something. Anyway, the Roundup was supposed to see to it that the tiger got a good home and plenty of red meat for diet. Now it could be that there are people in the world who need a tiger. The Roundup, although officially supposed to be the Voice of the Theater, actually can speak only for itself. But, so far as we could see, we need a tiger strictly the same way Hitler needed a second front. Frankly, we just wouldn't know what to do with it. We got frantically on the phone. We called genial Col. Frank Milani, chief of the Adjutant General's Office at Rear Echelon Headquarters. We don't know why we selected him to call, particularly, unless it was because of the vague idea that all newcomers to Rear Echelon are supposed to clear through his office. 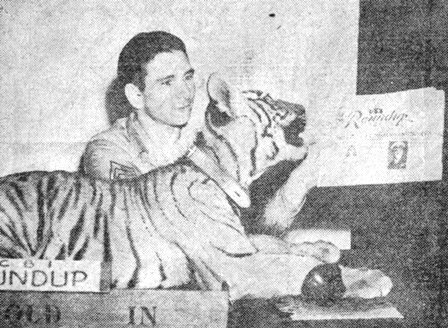 Even so, we somehow failed to convince Col. Milani that the tiger was his baby. The next thing we knew, Brig. Gen. Benjamin G. Ferris, Commanding General, Rear Echelon, was in on the deal - and frankly, Ye Ed, a timid soul, does not know which makes him more nervous, tigers or generals. We're not speaking of Gen. Ferris in particular, just, to coin a phrase, generals in general. Fortunately, we did not have to deal with Gen. Ferris directly. But in a round-about way we got a message which boiled down to: "Nay tiger, sahib." Nay tiger, that is, in the vicinity of Rear Echelon Headquarters. 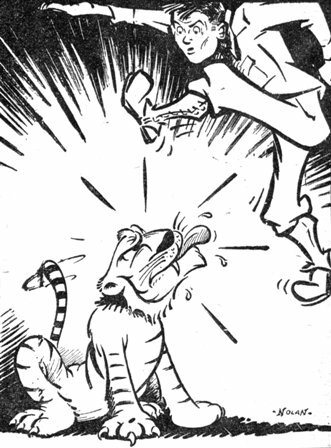 So now the tiger, figuratively speaking, has gone up and down the line and is back in the sergeant's lap. He loves the tiger and wants to keep him. But at last report he was writing to the zoo at Lahore, asking if they could use one (1) tiger. Meanwhile, the tiger is queening it over the boiler room in one of the Rear Echelon barracks, while the commanding officer thereof is thumbing violently through Army regulations to prove that there's nothing in his orders, damnit, that says he has to play nurse-maid to a hell-cat. And that's the last we heard about the tiger. Frankly, it's the last we want to hear. The C.B.I. Roundup is a weekly newspaper published by and for the men of the United States Army Forces in China, Burma, and India, from news and pictures supplied by staff members, soldier correspondents, the United press and the War Department. The Roundup is published Thursday of each week and is printed by The Statesman in New Delhi, India. 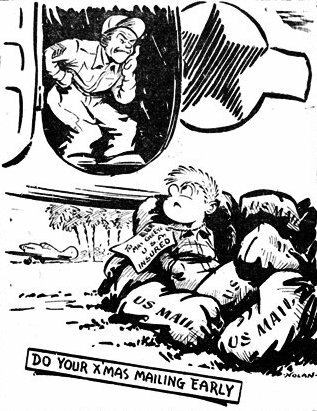 Editorial matter should be sent directly to Lt. Floyd Walter, Rear Echelon Hq., U.S.A.F. C.B.I., New Delhi, and should arrive not later than Monday in order to make that week's issue. Pictures must arrive by Sunday and must be negatives or enlargements. Stories should contain full name and organization of sender.